Before this post ensues, i would please request 3 minutes of your time. Please share any of the entries you like from the ongoing Untalented-Adjustments contest as findable on https://steemit.com/created/untalented-adjustments on your Twitter accounts. There are already more than 800 post entries and more than 5,000 comments created there in the past few days. Let’s trend these two tags on twitter “#steemit & #untalented. #untalented-adjustments Contest Already Has More Than 800 Full-Blown Posts Beautifully Promoting Steemit. 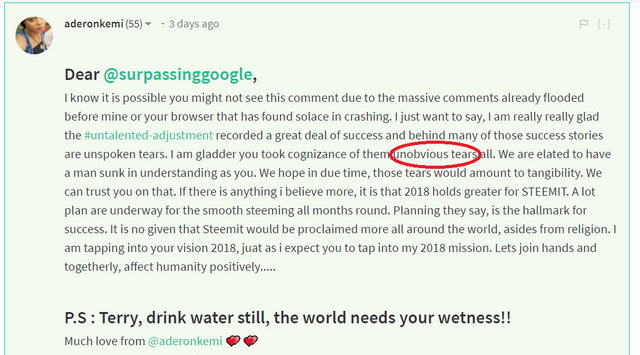 Let’s Go Make #steemit Trend On Twitter. Warning Note: This post may contain the word “tears” so many times but it is not a sad post; it is one drawn from envisioning and feeling from deep within a near future filled with so much inner joy and happiness after time in “donkey life”. “Life of donkey” simply has to stop and every and each tear that went into this race are beautiful tears. “None went to waste”, for they are resulting in this “new breed of tears” and an eventual “tears of joy”. Jesus knew he would attempt to raise Lazarus yet he gave to way to tears. With the advent of the TearDrops SMT, we are going old-school but a new breed of “old-school” as we embark on a journey that attempts to restore value to every and each “tears”, cried/uncried, happy/sad etc, thus, proving that these “tears” never went to waste. We will attempt to reward billions of humans who have shed tears down to every drop of it. By means, of the TearDrops SMTs, we will create even a new breed of tears and attempt to create many more “tears of joy”. We never know but perhaps, there are real life solutions in those tears, if we just attempt the first simplest obvious solution and restore value to dem tears. Perhaps, if we gather them into “oceans”, these ocean of tears can wash away some sorrow. Well, we never know! So we will try find out with @teardrops. I would open the first page of a virgin diary and cry these particular tears onto it, to rumple it for keeps. I have not tasted “tears of joy” till date but i have cried “a new breed of tears” and many of us have to, without being able to place it. Regardless, every and each tear will now have value because for one, they always have had value for Jehovah has kept keeping our tears in a skin bottle. My dad would wail and the Earth would shake as he wails and he would shake and vibrate because he wanted to love us so strong and his entire being wanted just this. Now he is broken and even in the middle of his glaucoma and now dementia, he manages to create “tears” and these tears drop and he stops, then he prays and he loves. These tears cannot not be valuable! Amidst the pain and sorrow, tears come from a place of intense love, hope, care, growth. “Tears” aren’t some sad fluid. “Tears” are a weighty thing of beauty. “Tears” are strong! With @teardrops SMT, we will evolve something that restores special value to every and each tear drop. The entire vision is not very clear yet but we will pace things and create something. Using all the feedback we get from the #untalented curriculum and other events participated in by our reputable community of great minds. Roadmap is currently in process! One more major thing: “in the equation, we will add more “tears of joy””. As for “proof of tears”, we will find #untalented ways to attain proof. Let’s go brothers and swities! #untalented is a curriculum that is design to create awesomeness. It is created to give value even to flaws and find sense in the things that the world has come to classify as nonsense. @teardrops token will be among the coming generation of SMT tokens. I can’t foresee how the entire process of ICOs on SMTs will look like but that matters less during this evolution as we like to keep our envisioning spanless. Thus, we will pace things and craft this whitepaper out slowly using unadulterated feedback from our loving brothers and swities here on steemit. Though this post is all drafty, @teardrops as an SMT etc to reward “proof of tears” and create more “tears of a joy and a “new breed of tears to the world” has begun. A Drafty Build Up Of The “Types Of Tears”. These tears are there/have been there but uncried because they need triggers. “Donkey life can harden human and deaden our soft spot”. Shedding these particular tears may solve something; who knows! Hahaha we are on to a journey, let’s see! Gosh, this beauty (tears) flows easy but they dry up now. Touching! We will be able to use @teardrops tokens to dry up many tears and perhaps, replace them with a new breed of tears. Who knows! Spotting hope. Hearing first whispers of goodnews. 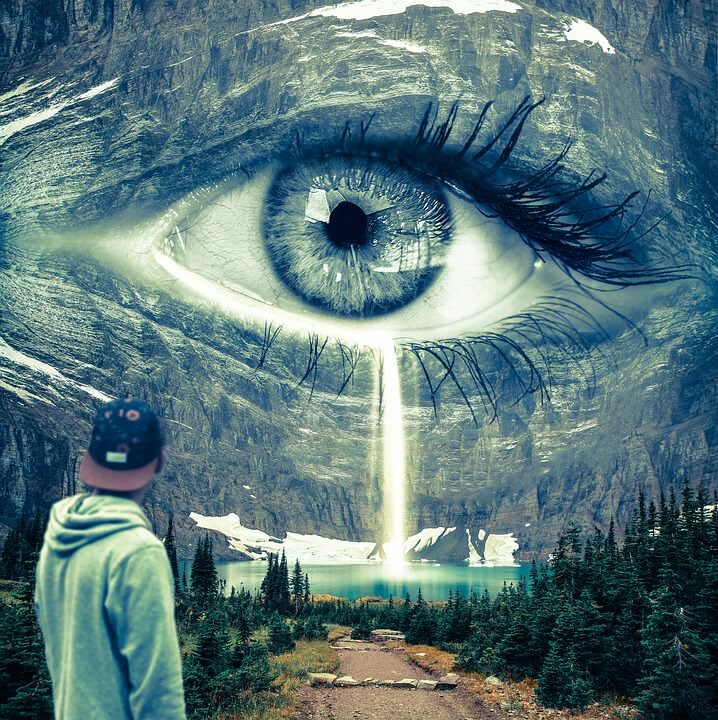 This beauty (tears) is in there and its full and with deep intense feelings and have a spot; touch this spot and the love will flow and it will be free-flowing and with these eventual teary eyes, there will be heart-smiles just after the heart-cry. We hope to touch these spots, with @teardrops (human and love) and reward this human beauty! A sudden another burst of tears resulting from so many ages of tears. I know this one, i so know this one! Every time my mum would call (on the phone) in the five years that i was away, before i eventually saw for 16 days (she died), we would be in tears back & forth as i tell her; “mum hang in there, i am coming with my first whispers of goodnews”. Hahaha, these particular tears cannot be not valuable! Above, the tears of another was used to fix my own tears. We will use the @teardrops token to fix the tears of many, together! Hahaha, we are playing and creating! We want to create a “new breed of tears” along with the “tears of joy” that we will experience, in this nearest future that is bright. We will spread special moments and this will involve every human, for every human has had moments and have dropped tears. This is a happy endeavor! For now, we will need your help over time as you are part of this movement. This may be the hardest portion of the whitepaper to create, so please help in the comments by leaving ideas! A major part of the whitepaper will involve “proof of tears”. I am still building on this playfully and enlisting those bizarre-looking ideas down. According to me so far, “tears are tears”. There is some “real factor” to “tears”, even with so-called “fake tears” but even if we establish that “tears are tears”, we haven’t solved “proof of tears”. So for now, let’s assume “tears are tears” and forget the “types of tears” and join me in the comments below, let’s brainstorm together. With @teardrops, we intend to catch the soft spot of every human’s heart. While most innovations of the world are designed with cognizance for millions, we target billions. If millions fancy cryptokitties, pokemongo and stuff, let’s see what the world will say when they’re rewarded for the constituent of each tear or each tear. Let’s see! We also want to adjust how the world perceives “tears” by giving “tears” value. (Even Jesus’ gave way to tears, thus, we see tears and drops of it as a symbol of human in its realest state). You should not be bullied for giving way to tears! In World news, fighters have got bullied for shedding tears have been beat in lost fights. Perhaps, we can get Celebrities to digital currency by rewarding them for times when they have given way to tears on public media and felt ashamed about it. Just thinking! or maybe Mary J Blige/Jay Sean will have a softer spot for joining the steem blockchain, upon hearing of our TearDrops token. Who knows! So let’s go! We don’t believe tears are symbols of issues but if the world thinks so, then let’s use some teardrops tokens to solve the tears. Hahaha, all crappy stuff! As we give away teardrops, we will create a new breed of tears. Imagine someone, who cries profusely (teardrops A) e.g because of “donkey life” and you stopped by him and say with a pat on his back: “don’t worry brother, here are some teardrops” and he is dumbstruck at this seemingly-coincidental timely act of unconventional unknown kind of love (where he is giving teardrops to fix his teardrops) and he suddenly bursts into another bout of tears (teardrops B). I tell you, teardrops B was a new breed of tears. While you may hurriedly call Teardrops B “tears of joy” like even the world may, in the intense donkey life that i have done, i don’t call those tears of joy. Sometimes, when you have done so-so-so much donkey life, even ordinary regular news becomes utmost jackpotty news. Infact, some people aren’t looking for lorry loads of money; their ears simply seek their very first whispers of goodnews! Alas, with teardrops we will also create so many tears of joy too! We will create one of the simplest whitepapers out there in the world using Smart Media Tokens. We want even children and babies who wan-wan-wan to understand our whitepaper. We will be as unconventional as can be, “no books” involved, just sheer heart and human. We just have some very illiterate knowledge in our hands that the scholars and elites of the world possess not and we will share this knowledge freely. We will go back to a new breed of “old school”. Well, “the school of life” is not in outer-space; it is in nooks and crannies of Mama Earth and you will have had to fully-provenly attend this school to create spanlessly, something @teardrops. When it comes to “tears”, there is nothing like painted tears; “it’s all real!”. We are very illiterate. Very untalented. Very human: “hearts intact!”. With teardrops every human, we will celebrate: “celebrities!”. To direct or re-direct each human to our Creator Jehovah. @samic said it fully here! @maya7 spoke of it fully here! 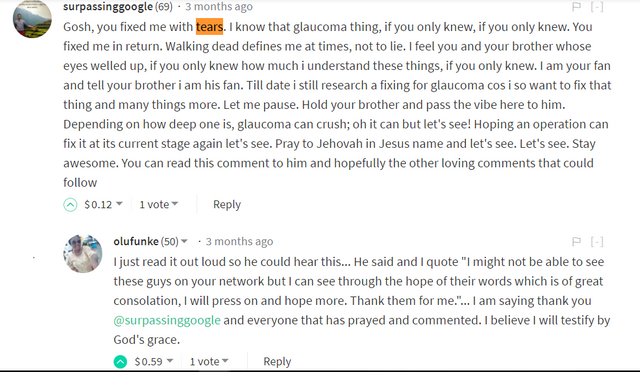 I did shed tears writing this post, so “tears” is a beautiful thing and never has any drop of it actually gone to waste for Jehovah has saved them in a skin bottle. If you can, share me a selfie of your in tears! Comment any ideas you may have about how we can solve “proof of tears” and flaws allowed, so let go even untalentedly! Thank you for endeavoring to read this post till its end. It is tied to ‘world adjustment’, so, thank you for joining in thus. My post was originally published here and will not be entirely complete without highlighting some 600 beautiful comments that it managed to generate.